I LOVE this … and it’s so true that we’re writing our own autobiography through every entry on a social media site. In fact, I’m compiling my Facebook status updates for my kids when they get older — I think they would be fascinated to read what I was feeling, thinking and talking about as they grew up … because of course, there’s much I don’t share with them. Very nice idea Mikalee. I’m compiling my blog posts for a self published book for my family. A high school friend comments that she likes the “stories” I post. She doesn’t say articles, posts, updates, soundbites, etc. Really great post. I think it’s time society taps out of the virtual would and reconnects with the real world. Congrats on Freshly Pressed. I think there is some weight behind the idea that increasing digital interaction reduces our physical presence / analog interactions. However, it also opens up new worlds and possibilities, too. For instance, I regularly listen to Garrison Keillor’s podcast via iTunes: wonderful story-telling! And I wouldn’t be able to listen otherwise as he is not on radio in my area, nor does he tour to our area very often. Thanks for the comment, John. I love Garrison Keilor and often listen to him via my iTunes as well. I really like the combination of fiction, non-fiction, and humor that he brings to his show. If you like audio storytelling, I’d also recommend David Sedaris audiobooks and This American Life (on which Mr. Sedaris is often a contributor). Oh, and The Moth podcast is worth checking out as well, much shorted (usually only 5-15 minutes), but very well done. There is something much more powerful about telling one another our stories face to face, not pixel by pixel. We need to know the effect on one another of our stories, whether tears or laughter, sighs or gasps. It’s deeply narcissistic to keep throwing data into the blogosphere without any notion how it’s being received. We can bore the hell out of millions of people! I want to hear the voice, see their eyes, and when I am story-telling I need to see and hear what’s compelling — and what’s not. I am now out publicizing my new memoir at speaking events and reading, and hearing people respond to it, face to face, is much more interesting to me — to provoke and curate a conversation — than blather on and expect their attention. I used to work at a book store and so looked forward to author visits. I hope you events are going well! I agree as well. Sometimes I post a random thought and then receive a comment from a total stranger who triggers additional related thoughts. A story is born or remembered through this process. Thanks so much for sharing! I love story telling and was pleased to see a post dedicated to the art. I believe you when you say we have increased our story telling or any telling for that matter, duly accredited to the social media and internet spark. Also, in recent studies it has been found that use of modern language such as emotions, abbreviated texts have enhanced the cognitive abilities of children amidst deciphering the abbreviations. But, I believe that art of story telling is limited to a few. Not everyone can tell a good story, people are more likely to write it out than to tell it orally. Twitter does help in constraining the words, and people have done well to express their opinion, but story telling is a different thing, not everyone can write a good article, not everyone can write a novel, not everyone can write for everyone, they are limited in their thoughts and actions. i have an affinity for books, but i agree with your premise. the medium of the story matters, but it neither stops nor starts the story. the story originates in the storyteller and germinates until it finds an audience. human beings must tell stories, and we will use what is available–twitter, fb, blog or cave walls. You know…this is a really great challenge. I was going to and still will be posting a freebie excerpt of a story on fan fiction. I never thought about doing something like this. I just might have to try this out for myself. I definitely think things are evolving and a story serial has been done before and wil be again but I think the idea of a story on Twitter would be tricky 🙂 The blog format would be easier and many do use it for their fiction. Overall tho, I don’t want to give up the paperbook! There’s something intimate and comfortable about curling up with a good paperback that can’t be replicated by anything with wires. Also, laptops and tea don’t mix that well! Check out Brevity (http://www.creativenonfiction.org/brevity/) and Six Sentences (http://sixsentences.blogspot.com/) for some flash non-fiction. Also, I can’t help but look at people’s Facebook updates and create the stories of their lives around them that have prompted the updates. Good luck with your (super) short stories. Congrats on FP! Nice post and thanks for the links – interesting stuff. I really liked this post. 🙂 It did bring up a question for me though. 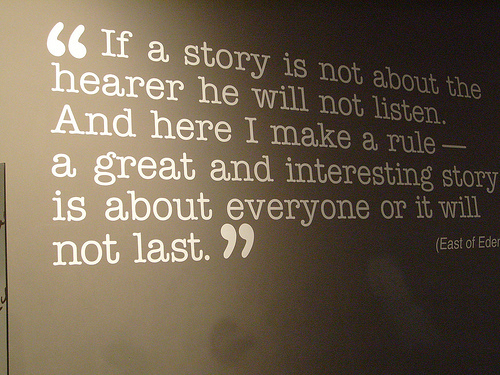 Why is storytelling so important in relation to digital social media? When I first heard about the importance of storytelling in today’s tech world, I was a little confused. Storytelling doesn’t seem that important to me. But Guy Kawasaki and other ‘connected’ people I’ve read about stress storytelling’s importance. Why do you think digital storytelling is important? Hmmm. For me, I guess I’ve never questioned that story telling is important. I think of it as a basic way that we interact with and connect with each other. It bonds people together and forges shared experiences. I’ve always been really interested in the study of what myths and creation stories say about a culture. I think that you can tell a lot about a people and what they value from the stories that they tell. Are you familiar with the Horatio Alger stories? Stories are often shorthand for our hopes as fears. My real interest in writing this is that we don’t lose storytelling’s place in our culture as we become a more physically disconnected society. I agree with you and Cosco. Imagine if we had twitter accounts for characters in novels? I know Lord Voldemort´s got one. 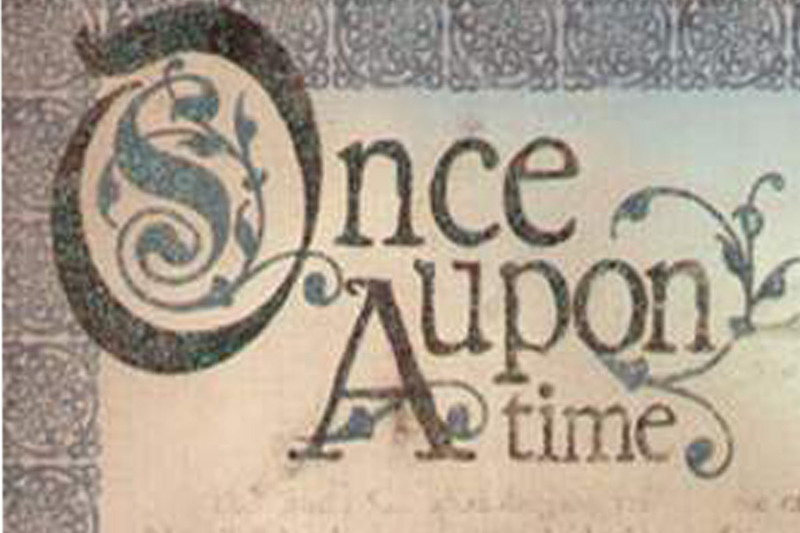 How cool would that be to construct an entire novel devoted entirely to telling it´s story through Twitter. 140 characters at a time. Each mini story would have to be extremely important and eye–catching, demanding writers to tell a succinct story worth reading. I´m inspired by the social media accessibility we have today. Yes, many more people can tell stories and some of them are unnecessary accounts of daily activities, but if we sift through the web, won´t we find the brilliant storytellers who might´ve not been heard 30 years ago because one agent said ¨no¨ to them and they gave up? Actually, there are fanfiction communities based on this idea. (Unfortunately, I’ve been out of that world for too long and I think most of them are friends only, so I’m unable to provide you with a link.) I remember a few Harry Potter communities in which each participant was assigned a character. Someone was controlling the overall story arc and would send a plot update to everyone every day or so. Then they would each write a journal entry for their character as if it were taking place in real time. And, they would comment back and forth in character. It was fantastic. In alter server training the priest asked us if we knew the 3 most important words said in a mass. One kid guessed “mass is ended”. Another thought it was “coffee and donuts”. The priest was going for “let us prey”. There is an art to being able to express your feelings or thoughts in social networking arena. I never considered that my status updates and Tweets would be my legacy. Maybe I should take them more seriously! And to think, for millenia the vast majority of people existed with no record of their existence other than their DNA. I suppose we are lucky.?! This should be motivation to make use of the new-found ease with with we can create. At what point will historians, museums, or historical societies start to preserve and catalogue the virtual world? It seems quite a daunting task to take a snapshot of the entire web. Since things online are always changing, you’d need to somehow capture everything at once if you wanted a representative view of the web of 2011, for example. I love your page (decor and message). I have the same question, too, about writing in this age of technology. I love writing, but need to know to effectively put my story ‘out there’, in an age where attention spans are shrinking. As much as I would like to have my work published on ‘paper’, I’ve heard that’s a dying medium. As well, the politics of getting a book published is a royal hassle, from what I’ve heard from other authors. You compromise a line, word, a paragraph, and, bit by bit YOUR story disappears. So you get published, but you hardly recognize the end result from what you started out with, which is counter-productive to why an author wants to get published. I don’t want to tell my editor’s stories, but my own. Talk about ‘the devil in the details’, huh? That said, do you have any recommendations for someone who wants to be an online author? For me, it’s not even about money, as I have a job and I’m also realistic about making a living off writing. Those who have been able to live off their work are a blessed few. This is a far cry from my idealistic youth, when I had great plans on writing and making a fortune off every book. What a great post! I love the idea of looking at all our social networking as a story. These tweets, messages, and updates will be around much longer than we ourselves might be, and they really do tell a story about who we are. I really enjoyed your post and it gave me a lot to think about. Thank you! Social media and narrative is something I participate in alost everyday, and is the basis for my blog. It also serves as a theme for much of Douglad Coupland’s work- addressing storytelling in a post-Microsoft, post-videogame, post-consumerist society. Thieves go where the money is, storytellers go where the people are–right now people are online. Every post on twitter is just one more sentence in the story of ourselves. Every photo on flickr is another freeze frame. Wherever people are, that’s where stories will be told. I totally agree. Very well said. Fully agree with this. I started my own blog at WordPress as a run-off, or an outlet as a part of other writing projects, not really knowing what purpose it would serve or where it would meander. New(-ish) to social media I am surprised to see that even what I have written is developing a form of voice and narrative, exactly as described in these posts here! Very interesting observations. I’m newish to blogging, too. I had the standard whine about my life blog in college, but somehow I don’t think that really count. Developing a voice and style is difficult, but it’s something that I’m working on. If you read a lot of my posts you may realize that I enjoy the word “that” way more than is useful and that I like to start sentences with “and” which I’ve been told is not, strictly speaking, allowed. But, I say it’s my blog and it works for me, so it stays. I hope that you have success in developing your as well. thnx Maggie. We have a story, it’s a Reno story. It’s about an exhibition of art, taking place in run down motel rooms, here in Reno. We had a feature story written about us and SFMOMA’S blog called us “notorious”. We’re getting some national publicity and we’ve been around only 5 years. We’ve had over 350 artists and performers involved so far, and there are no plans to stop. I’d love to hear more people telling our story as it’s something substantial. We are fans of anarchy, defined as mutual self-interest, and this ideal has made our voice blossom. Hit me back if I can share more with you.. that or just google us. I LOVED your post. This is something I never considered before as a social media junkie, but you are dead-on. Our means of communication may be changing, but the basic premise of story-telling is still there. Kudos! I am a twenty something and I much prefer non-fiction stories! It is important for me to hear about the things happening in the world beyond my centralized location. After moving away to college I became so much more aware of the idea that there is SO much out there. I came from a large city to a not so large college town and social media is a way for me to connect with stories from all over the world. I think that you can tell a story on twitter but without mixed media, etc. the story can never be fully realized. Social Media is changing the marketing and PR industry immensely. These fields are highly competitive to make a start in, but Social Media is bringing in more job opportunities. While seeking an internship this summer, I’ve stumbled upon countless Social Media Intern opportunities. I think it’s fantastic that companies are looking forward and realizing Social Media ranges from quirky status updates to live play-by-plays for companies and professionals. I really enjoy this topic and look forward to reading more of your articles! While what we post online does become our Legacy I think that it all to often compromises ‘true warm blooded’ relationships in that we have forgotten how to communicate ‘eye to eye’ as well as we, have learned to Bully people by ‘unfriending’ them publically or creating insecurities by not responding quickly enough to a Text or Message. So while Texting,Facebooking and all the other wonderful ways of the New World help us to connect…. I say… Have a cup of Coffee with a Friend! Connect eye to eye… and don’t forget to turn your phone off when you do. Be in the Moment. You’re right that online communication can’t ever fully replace in person interactions. But, as we’re spending so much of our time communicating online, I’d like foe that communication to be as rich as possible. I agree with your perspective, but it’s also worth remembering storytelling isn’t something new that’s only possible because of social media – the principals are the same as they’ve always been and we shouldn’t lose sight of that. Hi Maggie – While I believe that social media sites definitely have their merit as far as being more connected is concerned, this increased connectivity does not translate into better communication. I do believe that the art of verbal story-telling is declining, while the written form of telling an event should improve (i.e. evolve) as stated in your post above. However, most people are extremely poor communicators and lazy. Texts rarely say very much concrete, and messenger folks take the short road when communicating too. I agree. I have seen a shocking lack of basic grammar skills from many of the younger people I receive emails from. Maybe someone needs to make an app that charges the sender for sending tweets with improper punctuation. It does make a difference in the real world to have some semblance of language skills. I think that’s the saddest story that I’ve herd. Two thoughts: Remember the Taster’s Choice commercials that led viewers to their own liminal space, episode after episode, minute after minute? I loved those! And, a friend of ours lived out a real life, life and death story. As his wife posted updates on fb, we kept him in our thoughts and prayers. We put ourselves in the seats of our computers to find out news. Thankfully, it came out well. And still, another friend had an interesting experience…and so it goes, life’s stories. I’m afraid I don’t agree. If a person only communicates in short blurbs there is not a story there. A story requires involvement and if done right immersion of the reader or listener. Communication through Tweet twit blib whatever is simply that, a communication. Nothing wrong with communication, but that is all it is. A story is different. I believe that people of all ages crave a well done comprehensive story. Look at the popularity of Harry Potter. Rowling did not have any magic (despite what some zealots say) other than a gift for drawing a reader in and telling them a story. I agree. A twitter comment is just that, a comment. You could string 10 twitter comments and not come up with a story. Of course, I’m an old editor from back-in-the-day and some aspects of social media have made people lazy. Yes, a point. A good story has a point of some sort. I agree that social media can achieve some great things, such has the reporting and communication of people in Egypt, Iran or a place like that. The challenge to anyone who wishes to have their Tweet or Facebook post taken as a story to be interesting to stranger is to have enough comprehensive structure. Most of what is posted are reports of people going to the shoe store and who they saw there. I agree. Social media has definitely caused another evolution in the art of story-telling. Fiction certainly sell at bookstores but real life stories told and composed through Facebook wall posts or Tweets, are a run-away best seller of all time. There is an application on Facebook that shows all your status (statuses? stati? whatever) over the previous year and it is quite fascinating to see the story as it sort of unfolds. Of course, if you only update once every six months saying “so and so is tired” it isn’t much of a story, but if you are a fairly regular updater, it is really interesting. I’ve been trying to reconcile social media and story-telling in a new way, and your post helped me realize how this could be possible. So, THANKS! So true! So true. When I was younger and in college I wanted to be an author. I used to write quite a bit. Then life kind of caught me by surprise, and I got to the point I could not write because it was too much of an emotional investment. I can’t tell how many journals I bought and wrote in it 1 – 2 days and it ended. The next tactic I used is to not write complete sentences, just words. My journals may have met it a week. Most recently I started blogging and the words just flow from me. I don’t know what caused it. It just happened. I am so happy that I can write again. Speaking of which, I’m getting peoples comments in my email inbox. This does not constitute story. It is annoying. I agree. Social media has definitely caused another evolution in the art of story-telling. Thank you! What a great post!I really love your interesting idea!! !Thank you for your sharing!!! You raise some interesting points that I had never even considered. From an imaginative point of view, the Internet is our Otherworld, a mythic realm where all things are possible. If you can imagine it, you can find it in this Otherworld. What better forum for telling stories. Congrats on being featured on FP! While I did enjoy the article, I couldn’t completely agree with it. Yes, we all write parts to our own stories via tweet or status updates. However, not everyone is a good storyteller. There are many elements to take into consideration. I suppose this brings up: what makes a good story? what is good? Thank you for presenting this idea to us readers! Excellent pondering material. I think it’s sweet that social media is accidentally telling the story of our generation. In years to come, I will be intrigued as we look back our Facebook and Twitter and document our lives. Maybe I’ll be embarrassed to show my kids whenever they arrive! You’re right – we are all telling our story through social networks and blogging sites. It is an amazing way to share ideas and experiences, and allows to meet like-minded people across the world. And I believe that as with the Dickens example, a blog could no doubt turn into a novel. I perfectly agree with everything you say. Dickens was also a great example to support your thesis. of course writing short stories over Twitter responds to the fast pace of our times but it stands high as the evolution of the old stories told by our grandmothers. How could our children listen to stories and learn telling new ones, whatever genre they are, fiction o reality, if they hadn’t the chance to read them on Internet? I’ll write soon about fiction and technology on my blog. It might be good to define “story” more carefully. The impulse to tell a story is universal, it is how we make sense of ourselves. But what counts as a story? One could say that a picture tells a story, but in reality it elicits a story from the observer’s mind. It does not, by itself, communicate a narrative. It seems that social media is good at creating a database rather than a narrative. In other words, social media can assemble a vast amount of data from which a narrative could be drawn; in fact, it may very well invite a narrative, but it does not, typically, by itself create that narrative. I think its great what social media has allowed us to do! communicating with peoplke all around the world, electronically compiling data that years back we can refer to. Storytelling is so imprtant because it gives something to refer back to, I love it! I started writing my own story on my blog then it kind of got corrupted with me introducing another story line into it. Every time I meet somebody I put them into the story but change their name to protect them, or is it me I want to protect, not sure! And as for social media I cannot believe how it now appears to own much of what I do. Very true. The story has to have something for everyone, or else it wont last. If you like storytelling podcasts, have you heard The Moth? Two very enthusiastic thumbs up.